Gleditsia triacanthos var. intermis ‘Sunburst’ is a medium size of about 8 metres in maturity. Commonly called Golden Honey Locust for colour of the new foliage. This is a drought, and frost tolerant tree grown for the attractive foliage. The flowers are attractive to bees. The foliage itself is a deep green, however it is the new growth that is a golden yellow, as well as the brilliant yellow autumn colour that gives this plant its common name. Also known as the Golden Honey Locust, Gleditsia triacanthos var. intermis ‘Sunburst’, is a deciduous tree reaching 8m is widely used as street trees. 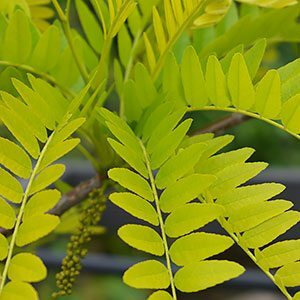 A medium to fast growing tree Gleditsia triacanthos ‘Sunburst’ is reasonably drought tolerant and with its attractive pendulous branches makes a good all round shade tree although it can also be used as a hedging plant. This is a thornless tree unlike some varieties, over time it forms a rounded crown with a slightly pendulous habit. Used widely in parks gardens and as street trees. Gleditsia triacanthos var. intermis ‘Sunburst’ is also well suited for the home garden for use as an ornamental shade tree. Best pruned in autumn, Gleditsia ‘Sunburst’ does not seem to respond well to pruning at other times of the year.